We’ll be making our various RBAPS project documents and outputs available on our website over the coming weeks (on our documents page) , and samples will be available tomorrow at our end of project seminar (see final agenda here, & we still have some places left so book now if you’re interested!). 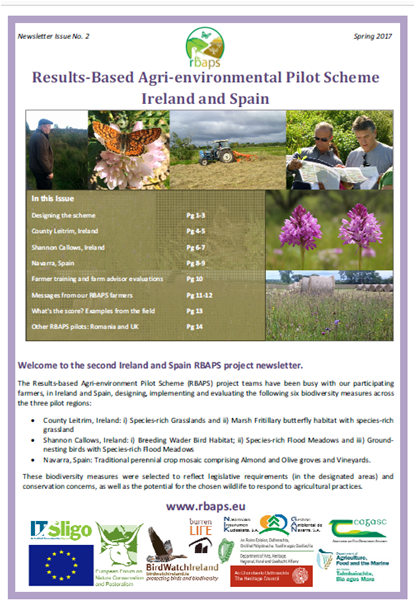 Additional speakers are now confirmed for the RBAPS end of project seminar, with talks form Aran Life project, and two EIP projects : Hen Harrier and BRIDE projects. More speakers to be confirmed ..
We now invite you to join us for our RBAPS end of project seminar. This seminar is aimed at anyone interested in the future of agri-environemnt schemes, including Farmers, Farming authorities and advisors, Agri-environment administrators, and those interested in European Innovation Partnerships, particularly those with a biodiversity focus. The seminar will be held in the Hodson Bay Hotel, Athlone, Co. Roscommon, on Friday 22 June 2018, from 10am – 4pm. You can view more information, including the agenda for the day, by clicking on the poster below. Please share this page, the poster below and the registration link with others who may have an interest. The Ireland / Spain RBAPS Partners’ meeting was held in the Institute of Technology, Sligo on the 14th and 15th June, 2017. We were delighted to host members of our sister project teams in the UK and Romania, along with representatives from the European Commission, Department of Agriculture, Food and the Marine, Teagasc, the Burren Programme, Aran LIFE project and the newly commenced Hen Harrier EIP project. As our RBAPS project enters its final year, the aim of this meeting was to discuss a broad range of key results-based topics amongst the diverse range of stakeholder interests in the context of their expansion in future. Our field trip brought us to a cattle grazed RBAPS farm at Kiltyfeenaghty Glebe, near Drumshanbo, County Leitrim which is entered into the RBAPS Grasslands Suitable for Marsh Fritillary (MF) measure. The habitat is a complex mixture of wet grassland in mosaic with heath, swamp and scrub. Both adult MF and larval webs have been found on the farm during 2016 monitoring and surveying. We reviewed MF scoring and general issues around setting biodiversity goals for species, particularly the appropriateness of setting the goal for the species, its habitat or both. The group discussed how scoring can be developed for grassland mosaic habitats, where boundaries between habitats are not distinct, and land eligibility under Pillar 1 and Pillar 2. Our second farm was a mix of cattle grazed pasture, wet meadow and also flood pasture along the River Shannon at Coraughrim, Carrick-on-Shannon, County Leitrim. Rushes on the land are topped (cut) annually by the farmer. Much of this land is typical of species-rich grasslands throughout Co. Leitrim and ranged from scores of 6 to 10 (out of 10). We discussed the scoring system for Irish Species-rich Grasslands and potential opportunities, threats and constraints to future wider roll-out of this option. 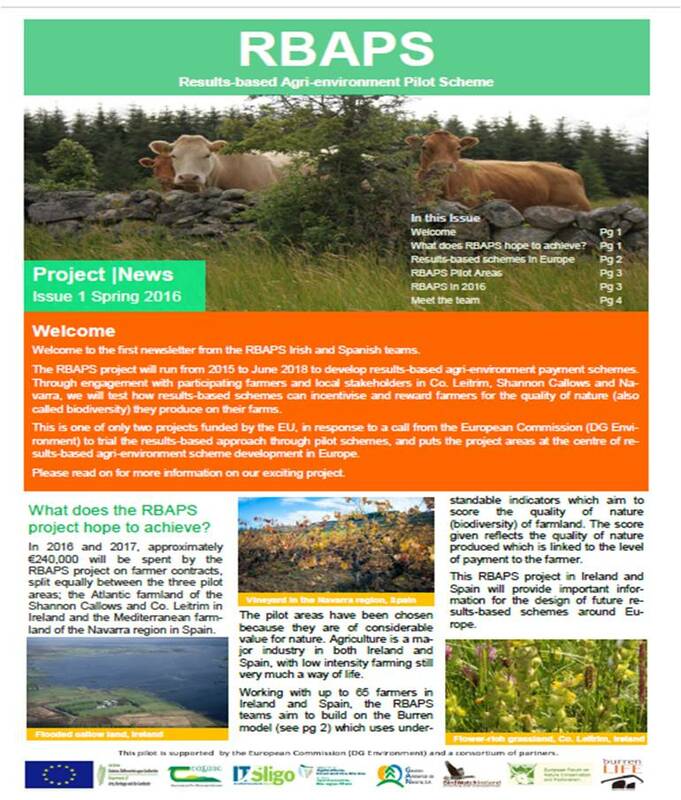 Both farmers are very positive about results-based approach and the RBAPS project and expressed strong interest in the continuation of similar types of agri-environment schemes. Following our field visits to the County Leitrim farms, we returned indoors to reflect on the discussion points of the previous day and broaden the discussion to include the key topics required for delivery of results-based approaches and schemes. Overviews of the RBAPS projects in Romania (Clunie Keenleyside) and UK (Vicky Robinson) were presented, along with the Spanish (Carlos Astrain) element of our own project. CAP post-2020 discussion runs in parallel with the discussions on the next multiannual financial framework. Thus the full financial picture on the CAP will be known only once the latter process is crystallized. It is expected that concrete outcomes of the CAP post-2020 dialogue will be available in 2018. To promote results-based schemes, it is important to build a good collaboration between all key actors and facilitate atmosphere of trust in order to ensure that they are well accepted in farming community and endorsed by national authorities. It needs to be ensured that all relevant mechanisms necessary for a strong absorption of potential funding opportunities for result-based measures are in place before a wide roll-out. The European Commission is looking forward to the contribution of RBAPS pilot projects to the ongoing discussion on post-2020 CAP. However, the current multi-annual financial framework should not be neglected in terms of promoting result-based measures as effectively spending opportunities thereunder will run until 2023. It is important that different data streams are brought together to provide a good knowledge basis for input to policy discussions, and particularly for results-based schemes. The EU can help Member States with information for results-based schemes which might be considered for inclusion in Rural Development Programmes. The Commission is exploring options for monitoring biodiversity in agricultural landscape, which would bring together different work streams and add new ones like plants or pollinators (considered in the context of enhanced EU action on pollinators, which is considered also through a potential dedicated initiative). Mapping and Assessment of Ecosystems and their Services (MAES) is well underway (to be finalised by 2019), and this will be a key process to support policy making – http://biodiversity.europa.eu/maes. Important that the wording on the score cards communicate clear and understandable messages to the farmers, tax-payers and paying agency. RBAPS Irish and Spanish colleagues undertaking assessment of a species-rich grassland in County Leitrim. The design of results-based schemes should think about the full cycle of payments and how such schemes integrate with other farm payments. In the current project, we have used income forgone and transaction costs, but felt that these did not fully provide an appropriate basis for costings. It was also necessary to avoid double payments, and this relates to a need to simplify CAP. Transaction costs (e.g. for farmer engagement) are thought to be higher for RBPS by economists, but this is not specific to RBPS, also applies to MBPS – it should be done in both approaches for effective delivery. Capital investment may need to be separated from the payment for results in specific circumstances. If incorporated into the results payment, then it overpays some and reduces the signal that other farmers need to consider undertaking works. MS are inherently risk averse. Therefore there is need for specific RDP regulations (and implementation rules and guidance from the European Commission) to support results-based approach and also are MS keen to implement them? Creation of a market for public goods may mean taking into account actual costings, willingness to accept, politics and particular aims of measure – all together inform payment rates. This can lead to ‘subjective’ decisions on value of the public goods, e. how much is society willing to pay and how much is farmer willing to accept? Potential requirement for research (EU, Member State level) on payment rates and how to calculate them for results-based schemes. This may involve comparison (fairly and meaningfully done) with management-based payment schemes, including cost-benefit analysis for delivery of biodiversity and analysis of transaction costs. It is vital that this research compares ‘like-with-like’ and covers the lifetime of the scheme/farmers’ contracts, not just the set-up costs. Up to date costing guidance for results-based schemes should be available to MS. Maintaining and building on existing capacity will be an issue in the next few years preceding CAP post 2020. What is the capacity within Member States to deliver results-based schemes when some may not have considered this approach as yet? The results-based approach will require front-loading of expertise at the design stage to ensure that an effective and efficient scheme is available, which is meaningful and ‘simple’ to implement. Will MS have this capacity and expertise? Where they exist, upskilling of agricultural advisors will be essential. But who/what will take on this role where such structures are not in place? Progress in Ireland has been championed by the DAFM, and whilst there is an excellent basis from which to move forward In Ireland, it is not without potential challenges. In Navarra, Spain, the RBAPS team have highlighted the need to develop links between paying agencies, government departments, academics, NGOs etc to move forward the results-based approach. Therefore, need for multi-organisation discussion and interaction. We can ‘squeeze’ in results-based schemes to existing legislature and articles (28, 35), but this is not sufficient as there may be constant fear of auditors and inspections (Member States and farmers). It will be important to the farmer that the paying agency and the auditor use the same criteria for assessment and that these criteria can be easily mastered by a non-specialist after a short training session. Are changes needed in the way agri-environment schemes are audited? At the moment the focus is on the finances only and possibly not an environmental cost-benefit analysis. It is possible that in-built assessment of the quality of delivery (i.e. the score) should make auditing easier. The next round of RDPs may be 5 plus years away from implementation, and it is unlikely that the current round of RDPs will be changed to allow new measures, such as specific measures for results-based approach. The big question is how to persuade managing authorities, who are increasingly risk averse, to deliver results-based measures through their RDPs. What is the motivation for Member States in developing their RDPs – will agri-environment schemes be a priority for them (or not) in allocating budgets and targeting schemes, when faced with a wide range of competing priorities? At Member State and EU level, the design, targeting, costing and approval of results-based schemes needs to be undertaken at the same time in the RDP cycle as management-based schemes. One of the challenges to this is the front-loading of development time and ‘thinking time’ needed for results-based schemes. The timescale of agri-environment schemes, typically 5 years, is not always an efficient way of securing the long-term environmental benefits of results-based schemes. Farmers are being supported to invest in producing a crop of biodiversity/public goods, and they (and the tax payer) need to be sure there is a long-term ‘market’ for these goods. It can be difficult to get across to managing authorities and other audiences the role of the indicators in RBPS, the importance of basing them on sound scientific data, and testing indicators (scientifically and with farmers) before the scheme is launched. Indicator achievement is not an assessment of the success or impact of a results-based scheme. To evaluate the performance of a results-based scheme against its defined environmental objectives requires gathering baseline and subsequent resurvey data. It is very important that the farmers and the paying agency understand the scheme’s objectives and both use the same method in the field to assess/score the results indicators. This leads to a shared understanding and, most importantly, can reduce the fear/risk of unjustified payment penalties from the farmers’ side, and of errors identified by auditors from the managing authorities’ side. Integration or updating of mapping data is needed e.g. in the Burren there are some discrepancies between the Land Parcel Identification System (LPIS) area and the management area as measured out by the Burren Programme. Additional pilot schemes may be required for areas and habitats not already covered. Is there potential to develop results-based schemes for other ecosystems services and resources, such as soil? Continuity between pilots and mainstream agri-environment schemes is also an issue, how to avoid the ‘big gap’ where there is no scheme or research being developed? Also need to distinguish between widely available management-based measures and higher-level/unique agri-environment measures (whether results-based or management-based). Key message: this is the build-up phase to results-based and we must remember it has taken a very long time for measurement-based agri-environment schemes to be set in place across the EU, through an iterative process of development and improvement. Who and what does the results-based approach best suit? It is not a panacea, but rather one of a number of tools. RBPS are not always the answer: Action-based approaches may better suit certain situations, while in many cases a ‘hybrid’ approach may work better. RBPS are part of a spectrum of approaches and the most suitable approach may vary from place to place and time to time. The success of a result-based approach will, as with other approaches to AES, ultimately depend on its success in engaging the farmer and appealing to his/her value system – this relates not just to the pocket but also the ‘head’ (capacity, training) and the ‘heart’ (local pride, sense of ownership etc) of the farmer. Results-based speaks to farmers as business professionals, as it provides them with a clear incentive to work towards a market for their public goods. It also allows them much greater ‘freedom to farm’ and creates a greater appetite for learning new ways of working. Payments to farmers do not relate only to the amount of money, it also relates to issues such as transparency, fairness, meaning and respect. The structure of the payment (e.g using banding and/or inverted payments) may also be used to ensure better impact and value. Clear and effective communication of the scientific basis of the scheme is very important to farmers and the public: while the ‘background’ of such schemes may be complex, the concept and its explanation must be simple. RBPS’s need to be part of a much bigger picture with many more ‘actors’, new partnerships, and more added value: foods, rural development, community wellbeing, education, agri-tourism. We are hugely grateful to all participants for their input and contribution towards a very interesting and productive meeting. We look forward to further meetings and conferences as our project moves towards its completion in June 2018. Within the development of LIFE 13 BIO / CY / 001114 AgroLIFE, the RBAPS team in Navarra were invited to participate in the workshop on “High Nature Value Farmlands (HNVf): Science, Policy and Agro-tourism”, which was held from March 1 to 3, 2017, in Limassol, Cyprus. This meeting was very interesting to both teams, since both projects, AgroLIFE and RBAPS, develop the concept of HNVf on Mediterranean perennial crops (olive and carob groves in AgroLIFE, and olive groves, vineyards and almond trees in RBAPS). AgroLIFE and RBAPS have established similar yet diverse concepts around perennial crops in terms of selecting high nature value elements that are part of the farming system, as well as monitoring procedures. On the other hand, from the RBAPS experience in Spain, we were able to show the application of the concept of results-based payments on the agri-environmental measures, and the consequent weighted payments associated with them. The workshop was carried out over three days. The first day focused on scientific knowledge, and several presentations were done about HNVf in Cyprus (concept, cartography, birds and the AgroLIFE project itself), HNVf in other countries or projects (Burren in Ireland, RBAPS in Navarra, Spain, Ancient Olive Groves in Italy, BioDiVine in France), and reflection topics (“restriction or opportunity” from Greece, “developing and sharing innovation” from Ireland). Carlos Astrain of GAN-NIK, presenting RBAPS at the Agro-Life in Cyprus. The second day’s presentations focused on agrotourism aspects at a local level, and the role that HNVfs can play in the development of the sector in Cyprus and in the Rural Development Program 2014-2010 of Cyprus, as well as in its agri-environmental measures and LEADER, both as application tools for the economic sustainability of farmers and the supporting sector. The third and last day an interesting field trip was scheduled to the region of Commandaria. There we were able to enjoy a beautiful area of high nature value where perennial crops are part of a very well preserved extensive and traditional Mediterranean polyculture on a hillside landscape. We also visited an interpretative path inaugurated from the project, where we could check the investments made with the LIFE project in the promotion of agronomic practices that reduce the impact on fauna, flora and soil, the conservation of hedges, the construction of stone walls, and the plantation of native bushes. Interperative board for the Agro LIFE project in the village of Laneia, Cyprus. Vineyard plot in the of Laneia where management of the vegetation cover has been carried out under the Agro LIFE project. The exchange of ideas among our colleagues from Cyprus, Ireland and Spain was highly interesting. There is an aim to continue working together on the conservation of our HNVfs through the implementation of new European projects. Vineyard plot where maintenance of stone walls and vegetation edges have been carried out under the Agro LIFE project.